Oh no, I'm just the bearer of bad news this week. After Tientsin Mystic 2 changed its lead, we get another change in cast now that Arthur Chen Feiyu confirms the rumors that he won't be returning for season 2 of Ever Night 将夜. It doesn't seem like the best timing to break the news as the drama is still airing, but maybe it's best to be up front about it. It was sweet that Arthur Chen uploaded photos with Director Yang Yang who played a huge part in casting him in his very first drama. He writes, "Thank you to each and every one of the Ever Night cast and crew for the 200 days of companionship. 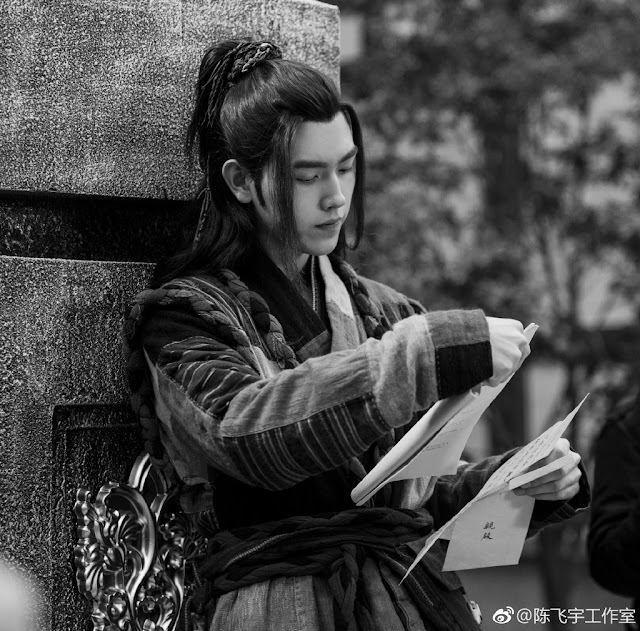 Thank you to Director Yang Yang for giving me the opportunity two years ago to enter Ning Que's world and to grow together with this stubborn young man. To me, you are like a strict mother, but also a close friend. Today's Ning Que can shine brightly on screen because of your meticulous guidance, turning a bashful kid like me into a young man. Thank you to everyone who has liked Ever Night. 宁缺毋滥 (Chinese idiom)"
Ever Night has been quite well received along with its rookie lead. It's unfortunate to know that the main actor won't be able to reprise his role due to scheduling conflict. 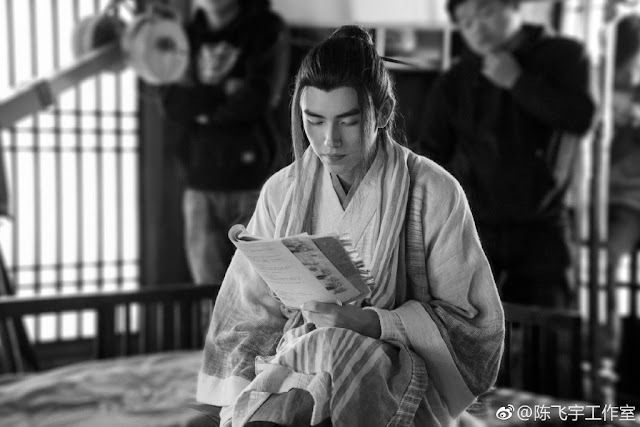 Arthur Chen is currently filming another fantasy drama called Legend of Awakening. Sighh... I’m so sad right now! ^x 1,000! Sad all around. I think everything have heard the rumor that Dylan Wang will replace him in the second season. I think this rumor is pretty solid considering Dylan said in the interview that his next project would be historical. It'd weird if he played Ning Que because I'm pretty sure second season is direct continuation to the season 1's story with the same set of characters. It's not a spin off. I didnt watch Meteor Garden so I dont know what to expect but hopefully he can bring the same charm to Ning Que the way Feiyu did. Now that I think, it's amazing that Eternal Love cast can reprise their role until Season 3 (which is confirmed already). Might be becaude the cast are not too popular and have no other better work offer hence no schedule conflict. It's so hard to get popular cast or big name cast to return for second season. 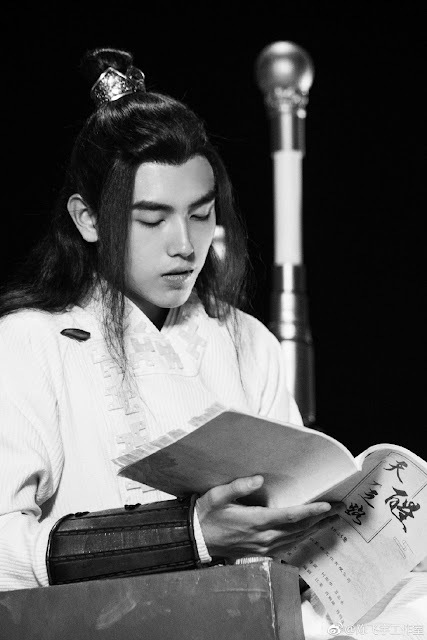 Feiyu is relatively new but he's the son of famous director Chen Kaige, naturally he'll get many other work opportunities. I think it's not just because he is a son of a famous director, but people have grown to love him too. He has a lot of potential. His acting is also acceptable, for someone his age, he is very handsome, and his arrogance and fresh casual/relax vibe are likeable. 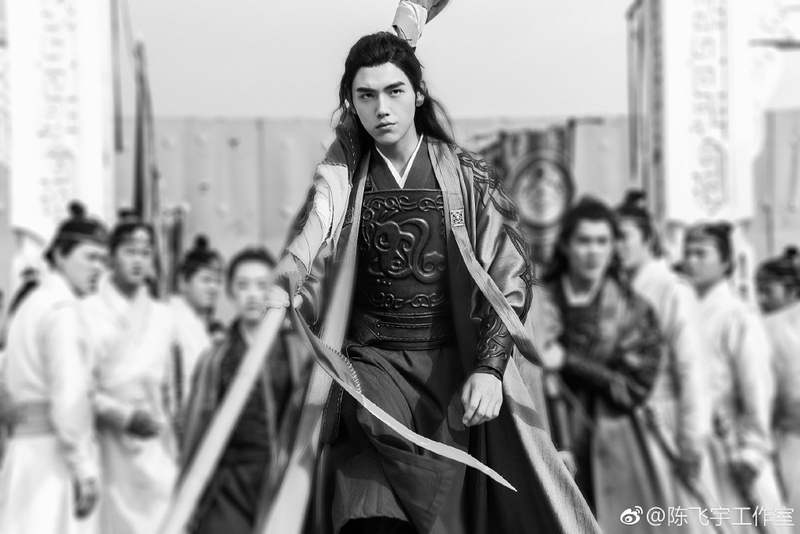 He also looked great in fighting scenes He delivers his movements smoothly with enough force, so it looked real. Sad news as I'm mainly watching because of Arthur Chen. Hope Legend of Awakening will be airing somewhere I can watch! Chen Feiyu was never the reason I watch Ever Night. First it was the anticipation following the trailer, then the good word of mouth, then of course the drama itself, which delivers so far! But I've grown attached to the cast, particularly him, Song Yiren and some of the supporting cast. So it's a sad news for me. It will feel bittersweet to complete the series, and it won't feel the same without him in Season 2. Agree with lenje above. I came to really like CF's NQ and his chemistry with the cast. I may give season 2 a chance but prays that it's not Dylan Wang - I just can't see him as NQ. If he is confirmed as NQ, I may just stick to the novels. Let's hope CF can come back for season 3.
oh you are definitely wrong i am 100% sure you are not watchinh the dear inn 2 which was a reality show he really fits the role that is why there is no audition for the lead the director chose Dylan Wang and no other than because he has his own original charisma. don't judge bol by its cover. you ain't nothing but to throw the trashes you've been loved out of the window. That's sad as I just started watching yesterday after all the praise this drama has received. Loving the drama so far and I'm enjoying Arthur's performance but I guess I will try not to get too attached to the actor now. I really don't mind the cast change since I've watched Meteor Garden, but yea, I just grow attached to the original cast in any show. I watched Meteor Garden and i am really not sure for this young actor. I feel for him actually as Arthur has made Ning Que his own and the chemistry between the 2 leads is so charming. Wait abd see and hope for the best. Arthur Chen blew my mind!! His NQ is arrogant, confident, lovable... For the first time i m liking this kind of hero. N i have watched a lot of movies n dramas. Its a good news and at the same time its a sad news for me. Good news he will have a new project but the sad part he must leave the other one. But I am congrats and good luck for the upcoming season two. It is always sad when a lead is changed, no matter the reason, however Aurther Chen made the comment about his director that I think will ensure the continuity of the character "Ning Que". 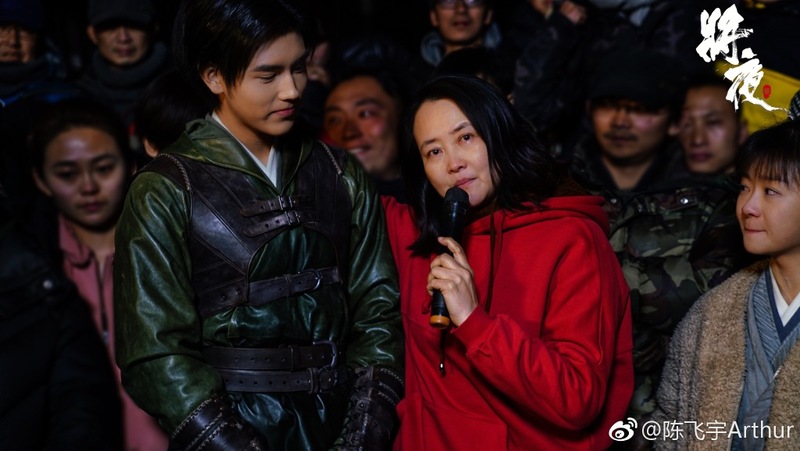 Director Yang Yang gave meticulous guidance to him on the characters role, for which he was very grateful. I can only hope and trust in her to maintain the Characters completeness in the series 2, even though we will have someone different. It is always good to sit back and watch a show, apllaud the actors and easily forget who and how they are motivated and driven. Some shows lose this drive from their Directors and eventually we can see the actors struggle to keep it alive. A good show is a two part symbiotic process, Great Director and a receptive Actor or Actors. Lets just wait and see, give it a chance and not be dooming season 2 before it has even started. I look forward to it and will support it as much as I can. You say that because you did not watch the season 1. How about us the satisfied audience in season 1? We are broken hearted now. And even you did not watch the season 1 still got high rating. Look at viki. This drama got high rating. That why you don't need to watch it because the rating is high already. I am very concerned the season 2 because many audience like me very dissapointed for the replacement of the main lead Actor Arthur Chen. I hope the Director and staff of Ever Night consider the emotional and chemistry attached to the audience and the main cast Arthur Chen. We have high expectations for season 2 Please don't replace the main cast. I am very sad 😭😭😭 we want Arthur Chen... I invest my quality time watching in season 1 i am concerned the emotional attachment and chemistry of the main cast Arthur Chen it won't be the same. Dylan is a good actor but in this role ever night 2 much better if Arthur Chen continue to be the main cast so that the audience won't dissapointed and give high rating. we are very satisfied Arthur Chen as Ningque the main cast of season 1... Now as a satisfied audience of ever night season 1, may we request the director and staff of ever night please don't replace ArthAr Chen and please don't broke our 💓. We want Arthur Chen as Ningque for ever night 2. I think I am in the minority as I think Arthur Chen is not a good actor. He makes the weirdest facial expressions and half the time I'm not sure what emotion he is trying to convey. Maybe in a few years he will improve but right now he is very green. I just wish the director casted someone who has actually been in a drama before. I have only seen Dylan in Meteor Garden but I think he did a good job in that so I think he will improve on the roll of Ning Que in season 2. Not agree with you. First reason season 1 got high rating. 2nd many satisfied viewer wanted Arthur Chen back. I watched medior garden 2018 version ep1 and ep2 only because I don't like Dylan Wang so thin. From what I understand, the high ratings wasn't really because of Arthur, but because the drama in general is good. Most comments I've seen around the web is Arthur Chen was only ok as Ning Que. High ratings do not mean the actors are necessarily good. Look at the Korean drama Boys Over Flowers. That got high ratings but the main actress was not good (she was universally disliked). Just because something got high ratings doesn't mean it was because of an actor. But I am happy you did like Arthur Chen and it probably made the drama much more enjoyable for you. How about the metior garden the original one compared to the 2018 version who got high rating? Of course the original one right? Enjoyable for him... In my opinion You are self centered I rate ever night 1 because of Arthur Chen. I heard that the director is don't want arthAr chen back. I don't know the reason. I am watching the first instalment of Ever Night because Dylan is the lead for the 2nd instalment. I thought it was odd that the director was fine with changing the lead but when I saw Arthur's acting, I felt that Dylan would actually do a much better job. Dylan was one of the reasons why Meteor Garden 2018 was refreshing. He had a lot of tearjerker scenes in Meteor Garden and he pulled them off really well. Arthur still has some ways to go. Dylan has a very strong charisma and Ning Que's character is utterly perfect for him. Not to mention, his action scenes look so good! I cannot wait for the second instalment of Ever Night! Ning Que and Dao Ming Si are different character, I saw Dylan photos as Ning Que he looks weak and thin, he needs to work a lot. It is the emotional scenes where Dylan will outshine Arthur. Frankly, towards the end of Evernight, Arthur's emotional scenes were horrendous. He just could not shed a tear. Yiren was heaps better. Evernight 2 is going to be an emotional rollercoaster and I believe that Dylan can bring that emotion to the screen. Seriously, If you read chinese novels uploaded on the internet, Arthur Chen exactly portrays the characters from historical novels. Don't judge him just because he is a son of a director and an actress, but it surely did help him to develop into a very good actor or artist since his foundation is already solid from the beginning.